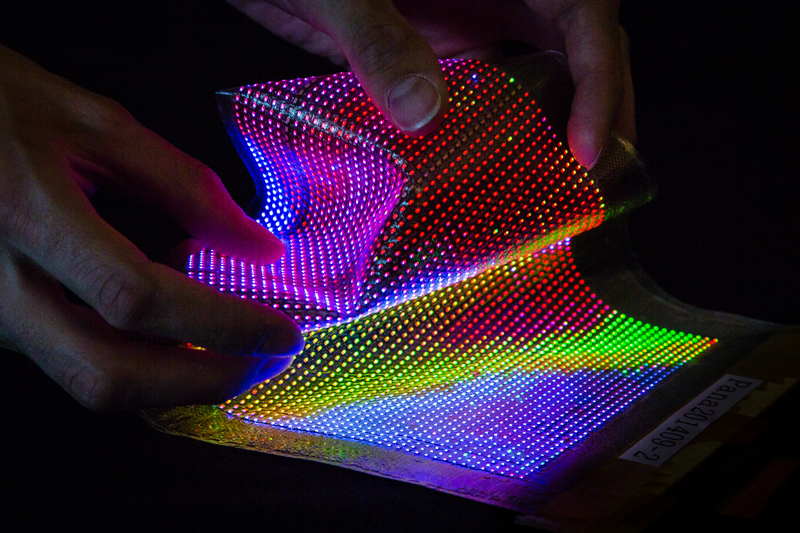 The world’s first stretchable and conformable thin-film transistor (TFT) driven LED display laminated into textiles developed by Holst Centre, imec and CSMT. Holst Centre is an independent R&D center that develops technologies for flexible electronics, wearable health solutions and perceptive systems for the intuitive internet of things, in an open innovation setting as well as in dedicated research trajectories. A key feature of Holst Centre is its partnership model with industry and academia based around roadmaps and programs. It is this kind of cross-fertilization that enables Holst Centre to tune its scientific strategy to industrial needs. Holst Centre’s fundamentals are to contribute to answering global societal challenges in healthcare, lifestyle and sustainability. This is visible through the motivation of its researchers, its different collaboration models and the choice of its research topics. Holst Centre was set up in 2005 by imec (Flanders, Belgium) and TNO (The Netherlands) and is supported by local, regional and national governments. Located on High Tech Campus Eindhoven, Holst Centre benefits from, and contributes to, the state-of-the-art on-site facilities. Holst Centre has over 200 employees from some 28 nations and a commitment from more than 40 industrial partners. Imec is a registered trademark for the activities of IMEC International (a legal entity set up under Belgian law as a “stichting van openbaar nut”), imec Belgium (IMEC vzw supported by the Flemish Government), imec the Netherlands (Stichting IMEC Nederland, part of Holst Centre which is supported by the Dutch Government), imec Taiwan (IMEC Taiwan Co.)and imec China (IMEC Microelectronics (Shanghai) Co. Ltd.) and imec India (Imec India Private Limited). The Centre for Microsystems Technology (CMST) is an imec associated laboratory at the University of Ghent. CMST has about 55 employees, the vast majority having a university degree. CMST is a centre for smart micro-systems integration focusing on design as well as on technology development research in six domains: High-density interconnection, including 3D component stacking and assembly; Large-area electronics, including flexible and stretchable electronics; Polymer Structuring and Microfluidics, including sensor and electronics integration; Optical interconnects and sensors, including flexible waveguides; Display systems, including LCoS micro displays and LEDs; Smart-power ASIC design, including TCAD-based high-voltage device development. Imec-CMST has a state-of-the-art cleanroom of 770 m2, housing all necessary equipment and tools to perform its research in the aforementioned domains: thin-film and thick-film deposition and patterning equipment, large area and stretchable circuit fabrication and assembly equipment, laser ablation and structuring equipment, test and inspection equipment, etc. CMST plans and executes collaborative projects with numerous Flemish and international academic and industrial partners. The 3800 TNO professionals put their knowledge and experience to work in creating smart solutions to complex issues. These innovations help to sustainably strengthen industrial competitiveness and social wellbeing. We are partnered by some 3000 companies and organisations, including SMEs, in the Netherlands and around the world. On the topic of Healthy Living we initiate technological and societal innovation for healthy living and a dynamic society. For more information about TNO and the seven societal themes that are the focus of our work, go to www.tno.nl. On the topic of Industrial Innovation we reinforce the innovative strength of industry through innovation in products and processes, with a strong focus on sustainability.